This is the labellum or lip. Its function is to attract pollinators (bees, flies, birds, butterflies, moths, hummingbirds, bats). The pollinators are attracted by the scent, nectar and sometimes by the color or shape of the flowers. 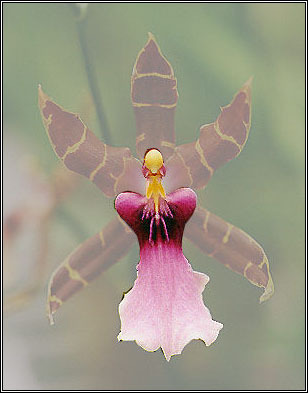 The lip is, in general, the most interesting and showy part of the orchid flower. In the Cattleya species, it is large and brilliantly colored. On Paphiopedilum, Cypripedium, Selenipedium, Phragmipedium genera, it is like a pouch or slipper. In the Coryanthes species is like a bucket and constitutes a true insect traps. Certain species have an insect-shaped appearance like Ophrys (the entire flower is a "pseudo-female"). In the Stanhopea species, it is so elaborated that is divided in three parts. In many Pleurothalis species, it is very small and inconspicuous. it is smaller than the other petals. It can be only vestigial as it is in Masdevallia. The lip can have fine appendages at the tip resembling antennae or horns ( like Phalaenopsis species of the group Euphalaenopsis, Phalaenopsis amabilis, for example) or decorated with hair, calluses, papillae, crests, hornlike processes, unci or hunchbacks or other appendices. Its marges can be smooth, fluted or heavily fringed like Rhyncholaelia digbyana Those elements are essential por species classification. The upper surface is furnished with fleshy tissue called the callus which can have ridges, warts, bumps or papillae. The lip has 3 lobes and sometimes the two side ones fold over the top of the column (and enclosing it) forming a tube called throat. The lip may be extended at the base into a tube called spur (Angraecum) and can contain nectar.